I'm studying some pics of modern engine refueling stations. 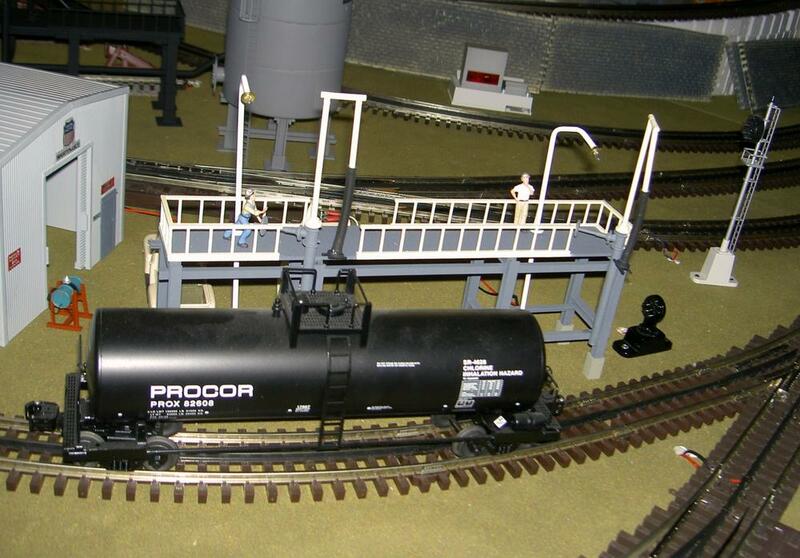 I've looked and can only find HO scale fueling rigs. 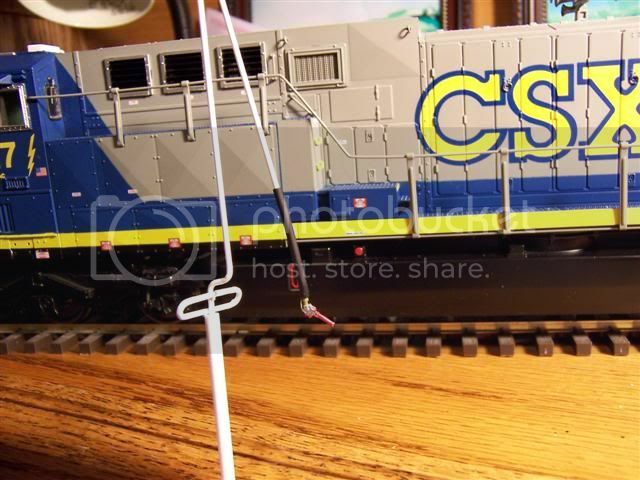 Are there some realistic scale ones made for O scale? "& 2 Snyder Fuel Cranes"
Weaver has done a nice job with the sanding part of it. They even give an exact drawing of this rig on their site! If I'm doing this correct, the pipes are 1/16". 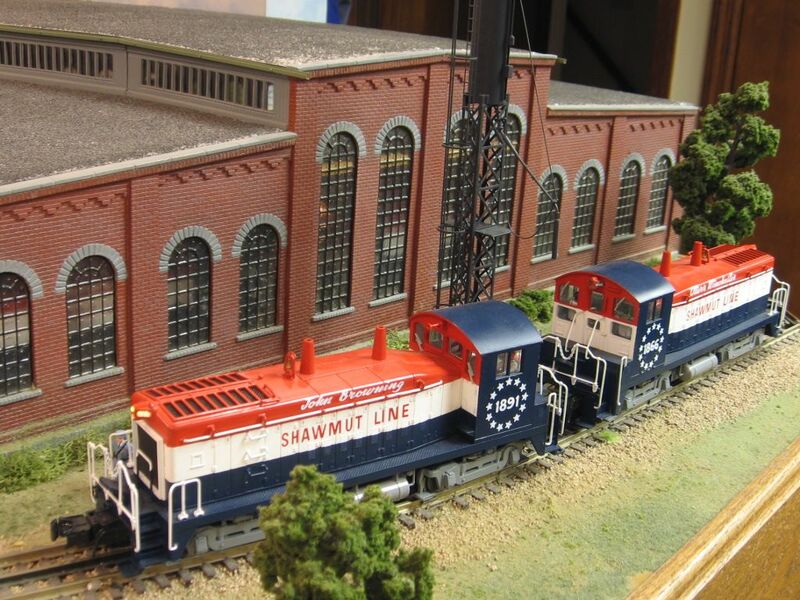 How can they make a N scale version of this??? It uses a 3" pipe so what would that be in N scale! Here's a quick mockup with 1/16" wire. That would equal the 3" pipe actually used. What did you use as a nozzle in the mock-up. I am currently thinking through my fueling ramp and copied the earlier picture you provided. Thanks! However, I am hung up on how to do the nozzle. I have a 4 station Overland brass sanding tower made around 2002, and talked with Brian Marsh at Overland about sources a the tower has some nice nozzles, but he could not help. Dave, can you post a pic of that rig? Yeah, I got mine in a modified Max Gray rig. They look great. I don't know who made them. I need to put a special grommet on them to look like the drawing. Then I think they'll be perfect. I've never seen a real one up close. I needed more nozzles so I just opened the Stewart Products HO double track service rig. The details look oversized for HO. I'm going to use them for my O gauge. They even look large still! Wow, what a rig. Very nice. I'm thinking that the platform is for older eras though? It looks like it was for sanding on top of the engine. The out riggers have hoses down low so I'm confused about that. A friend sent my this link today. Not sure what era you are looking for, but this one has good mass and because of its geometric shape could be quite buildable. That rig reminds me of Lionel's version. Yeah, probably a bad example for you guys, but... I was wondering if that could be used as a base for this? Although I am not a strong Diesel person Model Power made me one[plastic]. It is a vertical tank/tower with black hose and nozzle hanging down. He sort of weathered it in browns and decaled it with Southern Railway's Herald on 3 sides of the tank. As I recall $65. I am happy with it. Model Power does a lot of oil depot type stuff. Dave your Overland Sanding Tower looks VERY NICE!!! On that red fueling pipe,Is that wire,and if so what kind? 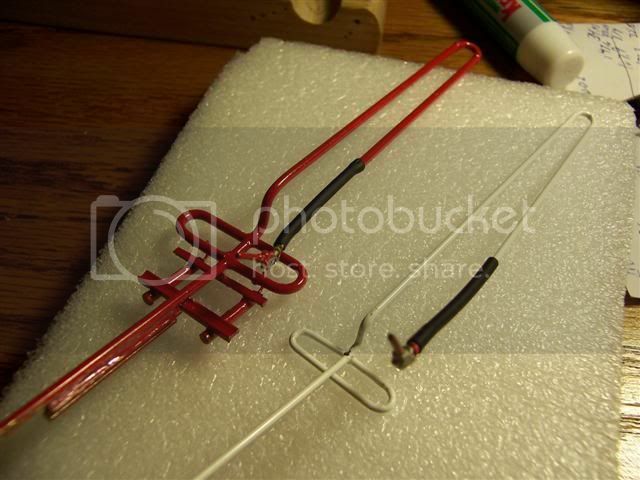 The red rig is brass rod. I believe it is .072. That was the size available that day at the hobby shop. I also ordered plastruct tubing and a bunch of elbows and fittings. It seemed easier to do in brass. Just an idea but that looks like it could be made out of a metal hangar. Look Fred!!!!!! What Tim? "Train just went through!" How can you tell Tim? It left it's tracks!!!!! Joe that is top notch buddy....what is the black tubing by the nozzles? 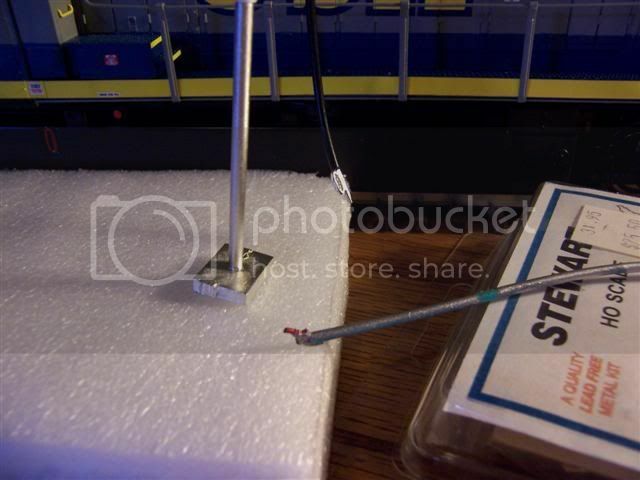 ?..Heat shrink?..I love what you have made there...I'm gonna be running steam but that sure is a great detail. Ok excellent I have one very near to me, gonna have to pop in and get some I see a lot of good uses for that....Thank you. For The "Hose" I have been using electrical wire,18,16,or whatever you want.For ends I just use plastruct tubes cut over them. Woa, were did this come from???? Bill, I haven't touched the RR for a while now. When the weather got nice, I started looking outside (G scale). I have a lot of projects going in all directions. Now if I could just complete some. I may start over with new benchwork for a multi level layout. That diesel building needs a lot of detail work inside. Tougher, now that it's built. Joe I am working on some thoughts for the fueling and Sanding facilities for my new Diesel Shop. I have my Transfer table set up directly in front of the area where my shop will be placed. I have an ABBA Shop right beside this new Diesel shop and a asile on the other side. So my Fueling and Sanding will be right in front of the shop. I am leaving 24" long area for the Fueling and Sanding. I was thinking that I could do shared facilites per pair of tracks. I have 12 stalls in the shop. So was looking for ideas on what others had done for their facilities. I saw the rig above that Milwakee road Dave has and thought that it looked pretty cool. WRT the hose I buy rubber gas line for model airplanes and attach it to a Plastruct RV-4 relief valve to make a filler cap. 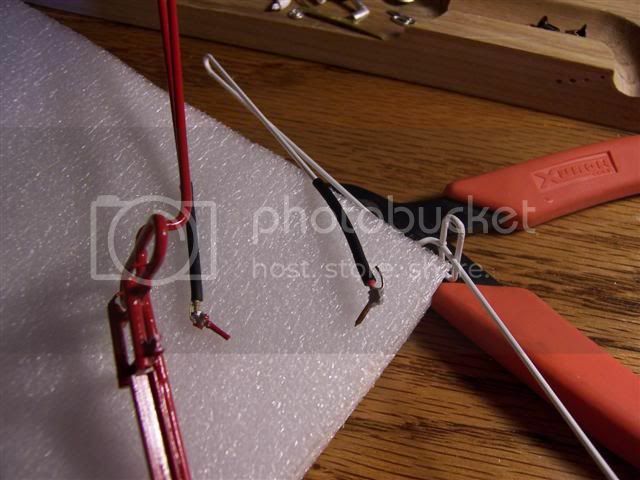 The other end is inserted into TB-4 tubing - see the photos below.